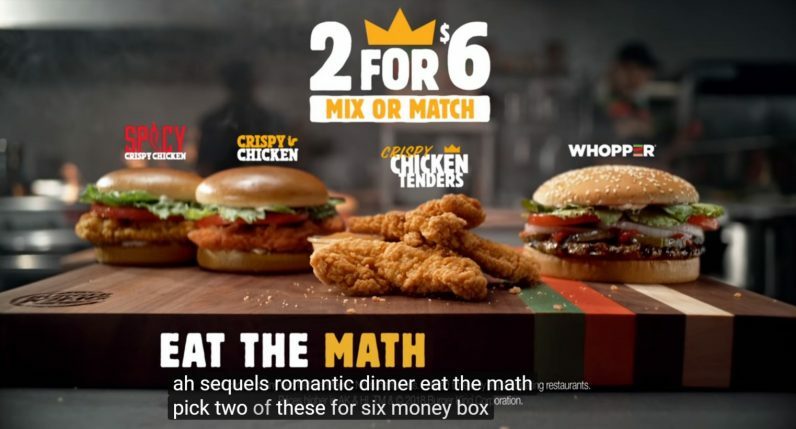 Burger King’s newest ad campaign mocks machine learning with a series of commercials that take a lighthearted jab at AI-generated media. Each video begins “This ad was created by artificial intelligence,” before devolving into delicious imagery and hilarious gibberish. The best part: None of them were created by AI. They were actually conceived and made by an ad agency called David Miami – the same company behind Burger King’s net neutrality-themed campaign earlier this year. The previous campaigns were part commercial, part social experiment (read that as “prank”), and this one’s no different. Burger King is playing along on social media, telling people it trained a machine to create commercials. So far, Burger King has uploaded five videos from the campaign to its YouTube page. According to AdAge, the company will begin airing them during prime-time TV slots on major networks in the first week of October. And, judging by the early reactions, a lot of people are going to believe that a computer actually did create them. A few industry blogs already got tripped up by a Burger King press release. Burger King decided to use high-end computing resources and big data to train an artificial neural network with advanced pattern recognition capabilities by analyzing thousands of fast-food commercials and competitive reports from industry research. It’s tempting to break down the nuances of Burger King’s new ad campaign. Is it a statement on the fear-filled nature of human existence? Should we view this as a catalyst for vast inner-reflection concerning our desire to destroy ourselves with low-nutrient, high-fat food while simultaneously displaying an irrational aversion to technology that could help us? Maybe there’s an important statement in Burger King’s seemingly tongue-in-cheek parody of AI. The humans who wrote these commercial are hilarious, if you ask us, and no machine is even close to this level of creativity … yet.